If you are facing a felony or misdemeanor or traffic ticket offense in Oakland County Michigan, do not go to Court without the help of a experienced local attorney. Hilf & Hilf, PLC aggressively defends clients at all Oakland County District Courts, Oakland County Circuit Court in Pontiac (also known as the 6th Circuit Court), Juvenile Court/Children's Village, and Federal Court. When your future is on the line it is essential to have a top tier local lawyer when going against police officers, Oakland County Sheriff's Department, detectives, city attorneys, assistant Oakland County prosecutors and the overwhelming resources of law enforcement and the criminal justice system. Results are what really matter, which often coincide with and the quality of your legal representation! Having an effective attorney with a sharp intellect and legal acumen, who does not buckle against the pressure tactics of city attorneys and assistant prosecutors, with experience handling cases before your Judge, a sterling reputation in the legal community, and who is looking to press for your every possible advantage, is precisely what you need in your attorney. Retake control of your life and your future by retaining Oakland County criminal lawyer Daniel Hilf. When it comes to criminal defense there is no room for any mistakes, bad legal advice, ignoring client communications, or for anything short of respectful and effective legal representation. Attorney Daniel Hilf's duty to his clients is to tirelessly and zealously defend clients who are at a bad moment in their lives, and to assert carefully crafted individual defenses for either trial or beneficial resolutions - no matter what the legal issue or accusation. Attorney Daniel Hilf is trusted because he is always in his clients' corners, and works extremely hard to prevent the system from running roughshod over clients and their families. His local Oakland County practice is an advantage to you, because he has the right experience and familiarity with the psychology and legal philosophies of the Judges, assistant prosecutors, and city attorneys to litigate to your best advantage. False accusations are outrageous because they flip the justice system on its head and improperly treat victims as criminals. A significant problem is that law enforcement practices have deep fundamental defects that sometimes promote wrongful arrests and lead to wrongful convictions. The causes of false accusations are complex and often include: assumptions that are misguided or wrong; mistakes made by police officers; bias; lies; deception; prejudice; persons that are purposely targeted by police officers due to a prior record (rounding up the "usual suspects" mentality); violations of Constitutional rights; and police officers jumping to false conclusions. Unfortunately police officers and detectives often believe that building cases against individuals is what they are required to do, instead of looking at matters in a neutral and objective manner. With some cases, such as domestic violence, it is sometimes guesswork to decide who (if anyone) was at fault. This type of mentality sometimes leads to the arrest of people who are innocent along with the guilty. Attorney Daniel Hilf pledges to you to work long hours to fight for the right, just result. Another negative are pervasive issue in criminal cases is the practice by prosecutors and city attorneys of overcharging individuals suspected of crimes. Overcharging occurs when the prosecutor or city attorney makes a decision to prosecute a more serious charge, even when the truth is that the conduct at issue was not as egregious as the prosecution asserts. For example, a person who was in a fight is sometimes charged with aggravated assault rather than just assault and battery due to a questionable injury allegedly sustained by the alleged victim. In some cases a great result is to prevent a client from being convicted of wrongfully inflated accusation, by litigating for the proper charge. Obviously a great result can also include litigating for a complete acquittal. The trial strategy involved for your case is to be decided by you and your lawyer depending upon the facts and circumstances of your case. Protection of clients' rights, compassionate representation, placing issues in the correct light, client communication, well thought out litigation, and a fighting for the right result all play large roles in the legal defense of attorney Daniel Hilf. Please feel free to contact him today, or at your earliest convenience, when you are ready for proper legal representation. Client Referred Oakland County Attorney Looking To Defend You In District Court, Oakland County Circuit Court, Federal Court, or Any Court Where A Lawyer Is Needed. Have you been accused of a crime, received a ticket, or have to go to court in District Court, Oakland County Circuit Court, or elsewhere in Michigan? Local attorney Daniel Hilf is ready and is prepared to offer you professional legal representation, if retained. 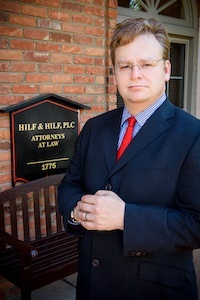 Attorney Hilf's office is conveniently located at 1775 W. Big Beaver Road in Troy, Michigan 48084. Make sure you throughly examine the qualifications of the lawyer who you are interested in retaining. Your examination of the qualifications of Oakland County defense attorney Daniel Hilf will uncover the following facts: he has over 20 years of experience with over 100 jury trials in the defense of many different types of criminal accusations; he is certified to handle capital level offenses; he has tons of extremely satisfied current and former clients; he is referred by other lawyers and former clients to handle cases; he has occasionally lectured other attorneys at the Oakland County Bar Association for criminal law issues; and he has won national awards for his legal advocacy. It is time to start having positive thoughts about the outcome of your legal situation. It is possible for you to hire a top tier lawyer, because payment plans are offered in many instances. In a times of need, you should also never underestimate support from friends and family. Hilf & Hilf, PLC accepts many different forms of payment including: credit card, debit card, wire transfer, money order, cash, cashier's check, personal check, giving you a variety of payment options. Feel free to contact Hilf & Hilf immediately for legal representation.